PNW District Optimist Clubs: How about one more Santa story? How about one more Santa story? The Jerome Optimist Club served more than 250 children at the Annual Breakfast with Santa on December 18. 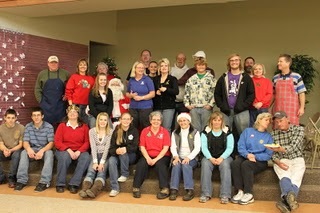 Santa Claus is shown here with his many volunteers. Breakfast was held at the Jerome Catholic Church with food donations from Ridley's Food and Drug and Subway. The Jerome Optimist Club sends a big thank you to all helpers and especially to Santa for making the day very special for all. Thanks to Traci Brandenbourg for the photo.